I once again found myself bizarrely drawn to a TV series about a Marvel character I don’t like to follow his own comic series for. I’ve pointed out that I do like him as an antagonist for classic heroes, or a guest star, and I think that’s why the series worked. 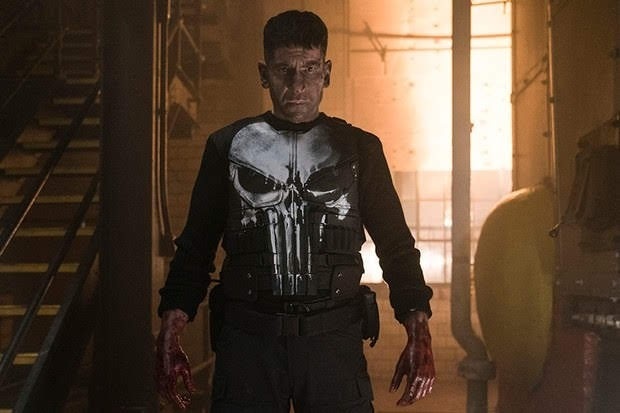 Frank, played excellently by John Bernthal again, doesn’t have much of an arc in the story. He’s not the Punisher at the start…buuuut, he really is and it’s only a minor nudge that makes him embrace it fully again. He’s really a catalyst moving through the story arcs of Amy, Agent Madani, Charles, even Billy and most definitely Mahoney. Overall it was a fast moving, entertaining show with insane action scenes. There are a couple of complaints that I do have, though. 1) At first I thought I could say it had one to two too many episodes, but I don't think that’s the issue. There were a couple moments where Frank had to do something stupid to keep the plot going. However, the two plot threads (Billy and Pilgrim) remained separate for the entire season. I think if they allowed the Billy story to resolve before the final episode, and built the Pilgrim story more slowly, it would have filled the space better. 2) Female characters really got the short end of the stick on this one. Amy showed some growth and development but outside of a couple moments wasn’t an overt actor. Madani’s competence was minimalized in most cases, and she should have been allowed to complete the arc with Billy. Billy’s loss of memory worked as a great mechanism for showing Frank’s vengeance didn’t put Billy in Frank’s place. Now Madani should have had a complete arc with him. Doctor Dumont was a textbook double stereotype of a woman psychiatrist both more messed up than her patients, and who falls for one to try to save him. And Beth came as close to being “Women in Refrigerators” as possible. Ignoring the one minor and one glaring issue, it was still well acted, and the violence was choreographed to be both visually stunning and built into the story. The villains were detestable but real world, with the exception of how much damage everyone could soak up. Yes, this is another counterpoint to non-powered comic characters being more realistic. Than I could believe normal marines could survive getting shot, stabbed, bludgeoned and blown up as many times as these guys did. Final note about notes- Tyler (Watchmen, Guardians of the Galaxy) Bates did the music. To say the awesome songs were worked in seamlessly with the score would be an understatement. There's no way comic book Frank would see Pilgrim as the same as himself, and discover forgiveness.